Q: When four adults confront a 5-day forecast that includes thunderstorms Monday afternoon and sunny skies the rest of the week, what activity do they choose for Monday? 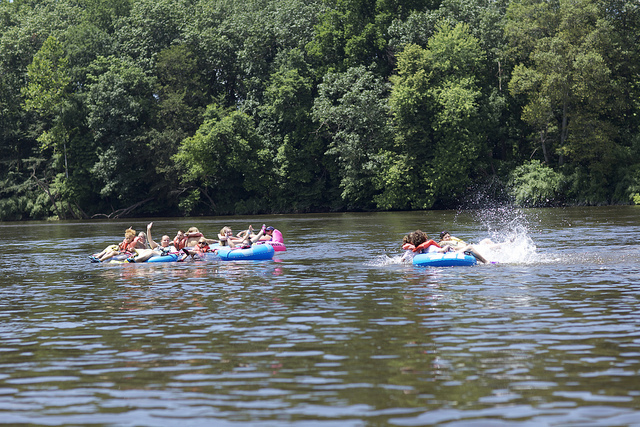 A: Floating down the Delaware River for three hours in innertubes. Emboldened by our rain-free bike ride yesterday, and with a mantra that “those forecasters are always wrong,” we set out for Frenchtown, New Jersey, site of Delaware River Tubing. Leaving no margin for error, “we” (by which I mean, of course, not me) reasoned that if we started by 10 a.m., we’d be out before the predicted storm. 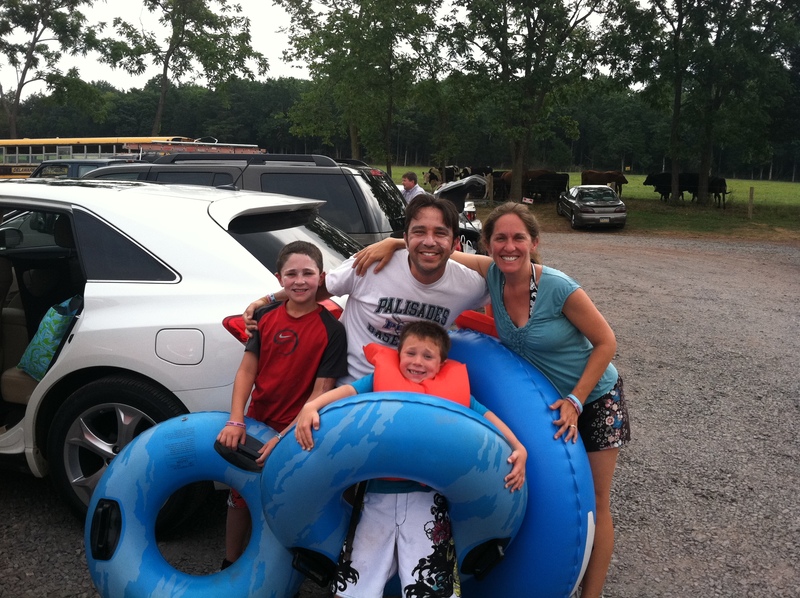 The friendly kids at Delaware River Tubing gave us an innertube, a smile, and a ride to the river. Our floating parade began under sunny skies, moderated by clouds that kept us thankfully cool. The river was as lazy as they come, making me laugh at myself for thinking this might be a dangerous endeavor. Then the thunderstorm caught up with us. Suddenly no one could remember whether it was safer to be exposed in the middle of the river, or sheltered near the river banks and all its trees. We strenuously paddled to a happy medium, appreciating that the storm added drama to what otherwise would have been an uneventful pleasure ride. What better than a brush with danger to sear a memory into permanence. The lightning caught especially caught Emmett’s attention. That’s the best kind of vacation activity — the kind that, no matter what happens, the kids want to do it again!